To get effective sun protection, kids need to use a sunscreen or sunblock with the right sun protection factor (SPF) that blocks both UVA rays and UVB rays. This would mean properly using a broad-spectrum sunscreen with a minimum SPF 15 or SPF 30. Other sunscreen ingredients only provide protection against either UVA rays or UVB rays, which is why many of the best sunscreens include multiple ingredients—that way they can truly offer broad-spectrum protection. Coppertone Water Babies Sunscreen Lotion SPF 50, for example, lists five active ingredients, including Avobenzone (UVA only), Homosalate (UVB only), Octisalate (UVB only), Octocrylene (UVB only), and Oxybenzone (UVA and UVB). Of these, Avobenzone, Mexoryl SX, and Zinc Oxide provide the most extensive UVA protection and at least one should be in a good broad-spectrum sunscreen. Mexoryl SX is the newest sunscreen ingredient approved by the FDA. It provides broad-spectrum protection against UVA and UVB rays and was previously only available in Europe for many years. It is only available in high-end sunscreens, such as La Roche Posay Anthelios XL SPF 50 Cream and Lancome UV Expert 20. Helioplex is a name brand for a sunscreen stabilizer that makes sunscreen ingredients more photostable so that they don't break down when exposed to the sun. Unlike all of the other chemical sunscreen ingredients, which absorb the sun's rays, Titanium Dioxide and Zinc Oxide are physical sunscreens that actually reflect the UVA and UVB rays of the sun. Newer micronized versions of these sunscreen ingredients have made them popular again. If your child has sensitive skin, use a sunscreen that is PABA-free, fragrance-free, and hypoallergenic. A physical sunscreen, with either Zinc Oxide and/or Titanium Dioxide, might also be a good choice, instead of a sunscreen with chemical ingredients. Of these sunscreen ingredients, the ones that may concern some parents include retinyl palmitate (vitamin A) and oxybenzone. 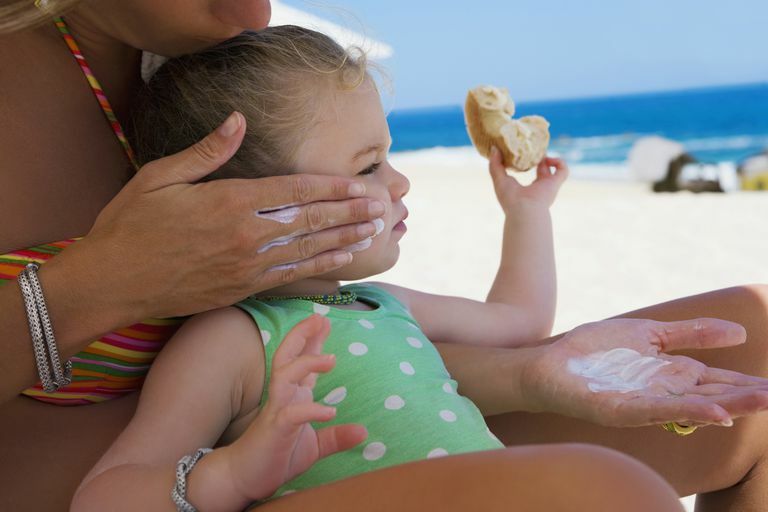 Although many experts already think they are safe, it is a common sunscreen controversy, and some parents choose to avoid them by looking for sunscreens with different ingredients. Ramirez R. Practical guide to sun protection. Surg Clin North Am - 01-FEB-2003; 83(1): 97-107. US EPA. Sun. The Burning Facts. September 2006.